My cousin spent three years trying various supplements, all of which were either ineffective in helping with her anemia, or made her too sick for her to be able to take them. When I found these at Walgreens, I picked them up on a whim, not really expecting much. Boy, was I wrong! Three months later, her anemia is under control and nearly entirely gone, with extremely minimal side effects. My mom became very tired often and when taken to doctor where the doctor found her to be anaemic. She was recommended for Iron supplements, we took Walgreens High Potency Iron Supplement iron supplement and found to see a good haemoglobin content increase in my mom in a months time. 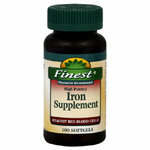 Iron is easily soluble mineral and hence recommended to be taken in empty stomach. Iron supplements are recommended 2 hrs after food. When taking iron supplements you can see you may have black stools and you need not worry about it.